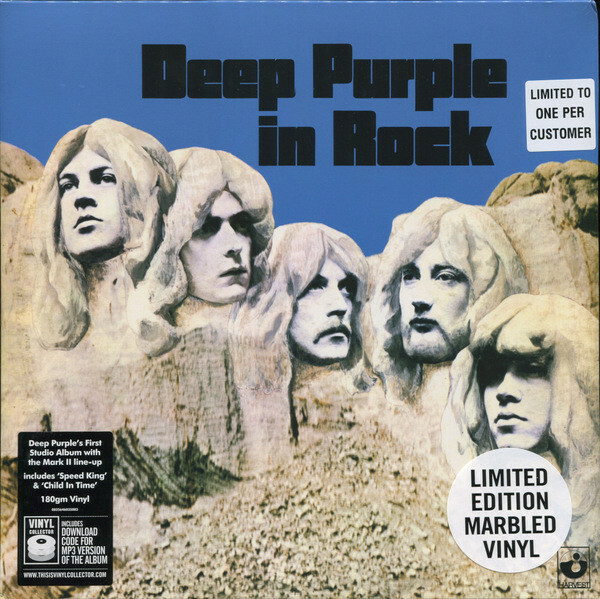 DEEP PURPLE-DEEP PURPLE IN ROCK-VINYL LIMITED EDITION. Without doubt, the golden era for rock music was the seventies. That was when rock music came of age. It’s certainly when commercial success and critical acclaim came the way of Deep Purple. Between 1970 and 1975 Deep Purple enjoyed worldwide success. 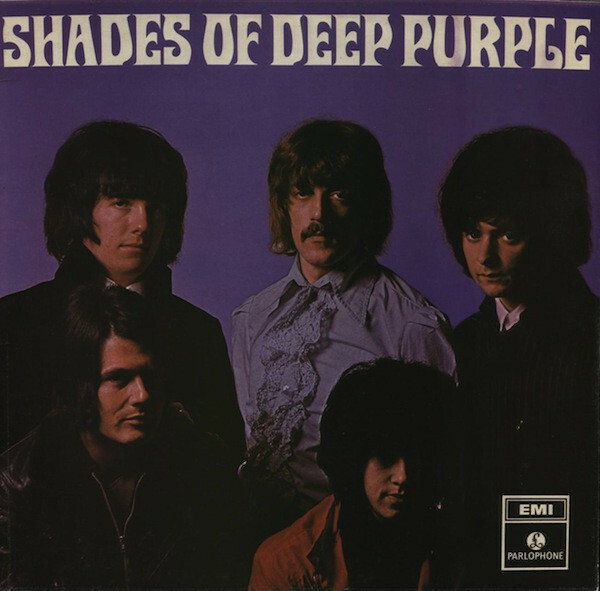 The album that started this run of commercial success was Deep Purple In Rock. 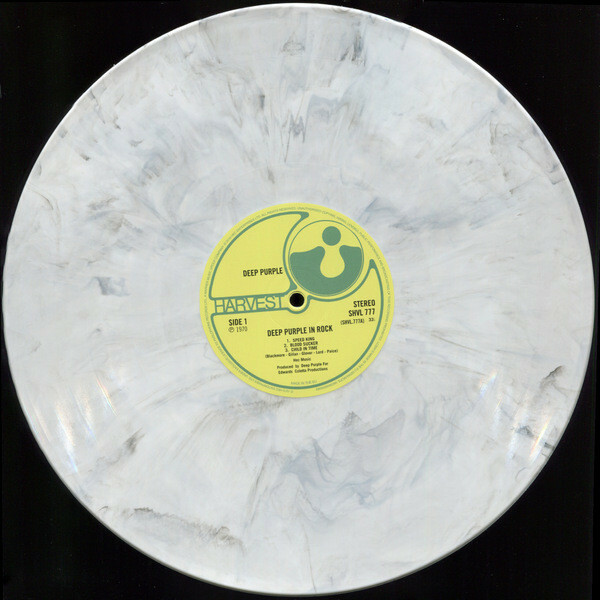 It was recently reissued on marbled vinyl by Harvest as part of their Vinyl Collector series. Only 1,000 copies of Deep Purple In Rock were produced, and a reminder of one the most successful and hardest rocking groups of the seventies in their heyday. The first member of Roundabout was Jon Lord, a classically trained organist. He’d previously played with The Artwoods. Guitarist Richie Blackmore, who recently, had been working as a session musician is Hamburg auditioned. He too joined Roundabout. So did bassist Nick Simper, whose most recent band was The Flower Pot Men. Nick was a friend of Richie Blackmore. The two other members of Roundabout were also friends. Rod Evans was recruited as the lead vocalists. Previously, he was a member The Maze. Their drummer was Nick Paice. Nick became the final piece in the jigsaw. However, he was not the first choice drummer. From Europe to Argentina, America and Japan, Deep Purple In Rock was a huge success. This resulted in gold discs for Deep Purple in America, Argentina, Britain, France and Holland. For Deep Purple, Deep Purple In Rock was a game-changer. Their decision to change direction musically was vindicated. Now, Deep Purple were one of the biggest bands in rock music. This was apparent on Deep Purple In Rock. Speed King explodes into life, opening Deep Purple In Rock. Deep Purple’s rhythm section are at the heart of the action. 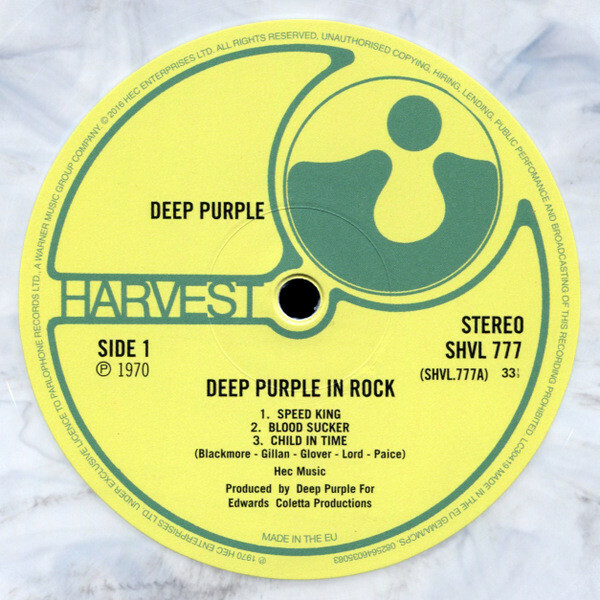 Ian Paice’s drums crack and pound, and with Roger Glover’s bass, drives the arrangement along. Meanwhile, Ritchie Blackmore unleashes a blistering, searing guitar. Ian Gillan delivers a powerhouse of a vocal on this slice of good time rock. This gives way Jon Lord’s psychedelic keyboard solo. Then a scorching guitar solo is unleashed at breakneck speed. When Ian’s vocal returns, briefly, he pays homage to Little Richard with a burst of Tutti Fruti. By then Deep Purple are in full flight. It’s an impressive sound, as one of the “unholy trinity” kick loose, and showcase their considerable talents before reaching a dramatic crescendo. Just Ritchie Blackmore’s crunchy guitar opens Bloodsucker. It’s played with speed and precision before the rhythm section join the fray. So does Ian Gillan’s powerful vocal. He’s always in control. Even when his vocal gives way to a vamp that’s reminiscent of Jimmy Page. By then, Deep Purple are in full flight. Ian is swaggering and strutting his way through the lyrics. When his vocal drops out midway through the song, Jon Lord’s keyboards and Richie’s guitar take centre-stage. They unleash peerless solos as they feed off each other. This inspires the rest of Deep Purple. Somehow they raise their game. A hard Deep Purple are accompanied by a machine gun, vampish vocal from Ian. It’s the finishing touch to this swaggering slice of glorious über hard rock. Understated keyboards open Child In Time. They’re played slowly and thoughtfully, taking care not to overpower Ian Gillan’s vocal. It’s tender and heartfelt, but grows in power and passion. When the vocal drops out, the rhythm section and cooing harmonies combine. Soon, though, Ian’s vocal becomes a powerful vamp as the momentum grows. Ian Paice sprays machine gun drums before Ritchie Blackmore unleashes a blistering, rapid fire guitar licks. By then, the arrangement is galloping along, all the time, gathering speed. It’s akin to a jam now. Deep Purple enjoy the opportunity to stretch their legs. Jon Lord’s keyboard solo goes toe-to-toe with Richie’s guitar. That’s until the arrangement almost grinds to a halt. Then keyboards begin to rebuild the arrangement. They’re joined by Ian’s vocal, which is a mixture of drama and theatre. Later, harmonies add to the drama as the arrangement builds, before this ten minute hard rocking opus reaches a dramatic ending. 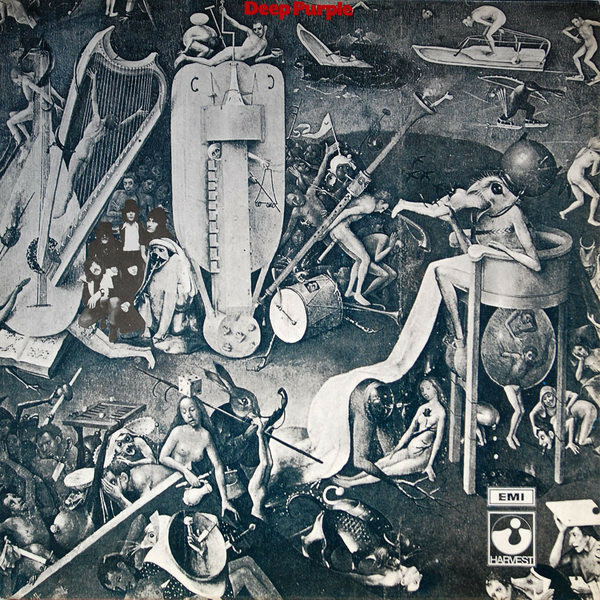 From the get-go, Deep Purple are rocking hard and fast on Flight Of The Rat. The rhythm section power the arrangement along, while scorching, blistering licks are unleashed. Ian Gillan delivers another swaggering vocal. By then, he had established himself as one of the top rock vocalists. Similarly, Ritchie Blackmore was one of the top rock guitarists, and his ability to play with speed, precision and accuracy is highlighted here. The same can be said of keyboardist Jon Lord. Meanwhile, the rhythm section anchor the arrangement, as Richie unleashes a succession of machine gun licks. There’s even a few funky licks thrown in for good measure. Then after the song almost grinds to a halt, Deep Purple are off and running. Drummer Ian Paice and Richie on guitar enjoy their moment in the spotlight, before the group reunite. They head for the big finish on what’s another epic track. The rhythm section and guitar combine on Into The Fire. It’s slower than previous tracks, but is just as rocky and heavy. Especially as Ian Gillan delivers a gravelly, vocal powerhouse. Behind him, the deliberate arrangement features Deep Purple at their heaviest. Later when the vocal vocal drops out, a scorching guitar sits atop, the chugging arrangement. When Ian returns, he continues to unleash what’s one of his best, and most powerful vocals, as Deep Purple seamlesly fuse elements of blues, psychedelia and rock. Drums set the scene on Living Wreck, before washes of psychedelic organ and scorching guitars enter the fray. They’re joined by another lived-in, throaty vocal from Ian Gillan. When his vocal drops out, washes and flourishes of keyboards join the rhythm section and scorching guitar. Midway through the track, the bass and keyboards add an element of darkness while searing guitars cut through the arrangement. Later, Ian who sounds as if he’s lived and survived the lyrics, delivers a vocal masterclass. Then keyboardist Jon Lord steps forward and unleashes a breathtaking performance. His keyboards play an important part in the sound and success of Living Wreck, which is a truly timeless track. Hard Lovin’ Man closes Deep Purple In Rock. Dramatic, rocky flourishes are followed by machine gun guitars and psychedelic keyboards. They’re joined by thunderous bursts that come courtesy of the hard rocking rhythm section. Equally hard rocking is Ian Gillan powerhouse of a vocal. Again, it’s reminiscent of Jimmy Page as it soars above the arrangement becoming vampish. By then, the arrangement is galloping along. Richie Blackmore unleashing guitar licks like a gunslinger. Jon Lord’s keyboards have a sixties sounds as he plays them with speed and precision. Sometimes he stabs at them, and they wail like a siren. Later, a searing guitar solo cuts through the galloping arrangement. It became a jam, before Ian’s vocal returns. Just like the rest of Deep Purple, he plays the role of Hard Lovin’ Man to a tee, as they take their bow on Deep Purple In Rock. Although Deep Purple In Rock was Deep Purple’s fourth album, it was the album that transformed their career. Before Deep Purple In Rock, the only success the band had enjoyed was a gold disc in Germany for their third album Deep Purple in 1969. A year later, Deep Purple In Rock was released to widespread critical acclaim and commercial success. It reached number four in Britain, but only reached number 143 in the US Billboard 200 charts. However, elsewhere, Deep Purple In Rock was a huge commercial success worldwide. From Europe to Argentina, America and Japan, Deep Purple In Rock was a huge success. This resulted in gold discs for Deep Purple in America, Argentina, Britain, France and Holland. For Deep Purple, Deep Purple In Rock was a game-changer. Their decision to change direction musically was vindicated. Now, Deep Purple were one of the biggest bands in rock music. This success lasted until 1975. Following Deep Purple In Rock, Deep Purple released another six albums between 1971 and 1975. These albums saw Deep Purple become one of the biggest bands in the world. This started when 1971s Fireball reached number one in Britain and thirty-two in the US Billboard 200. As a result, Fireball was certified gold in Germany, Holland and America. However, this was just the start. Having made a breakthrough in America, Machine Head was released in March 1972. It reached number seven in the US Billboard 200 and number one in Britain. Across the English Channel, Machine Head was certified gold three times in France. In Argentina, Machine Head was certified platinum. However, Machine Head was most successful in America, where it was certified double-platinum. However, this wasn’t the end of Deep Purple’s commercial success during 1972. Across the word, Made In Japan was a commercial success. After being certified gold in Britain, it was then certified gold in France. Made In Japan was then certified platinum in America, Austria, Germany and Italy. In Argentina, Made In Japan was certified double platinum. Just four years after they first formed, Deep Purple were one of the most successful rock bands in the world. This was set to continue. When Who Do We Think We Are was released in January 1973, it reached number four in Britain and number fifteen in the US Billboard 200. This resulted in gold discs in America and France. Compared with Deep Purple’s recent success this was seemed slightly disappointing. To make matters worse, vocalist Ian Gillan and bassist Roger Glover left the band after Who Do We Think We Are. Deep Purple’s career looked like it was at a crossroads. It wasn’t. The two departing members of Deep Purple were soon replaced. A then unknown David Coverdale became Deep Purple’s vocalist. Glen Hughes of Trapeze took over as bassist. They had big shoes to fill. However, with the help of the remaining members of Deep Purple, managed to do so during 1974. It was one of the busiest years of Deep Purple’s career. 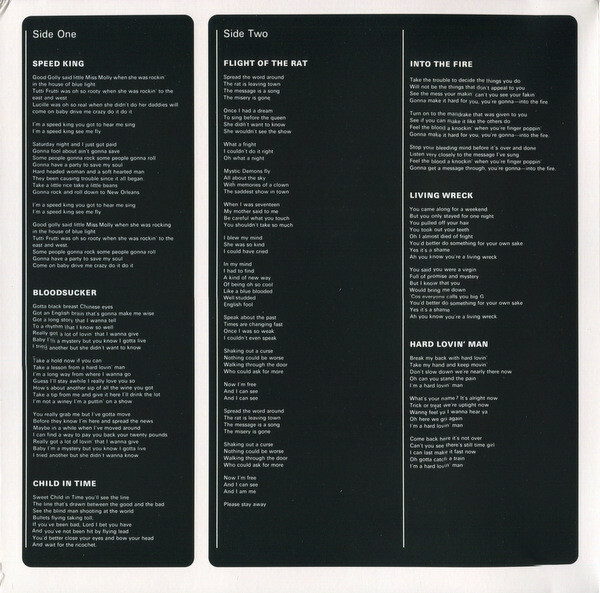 Burn was the first of two album Deep Purple released during 1974. 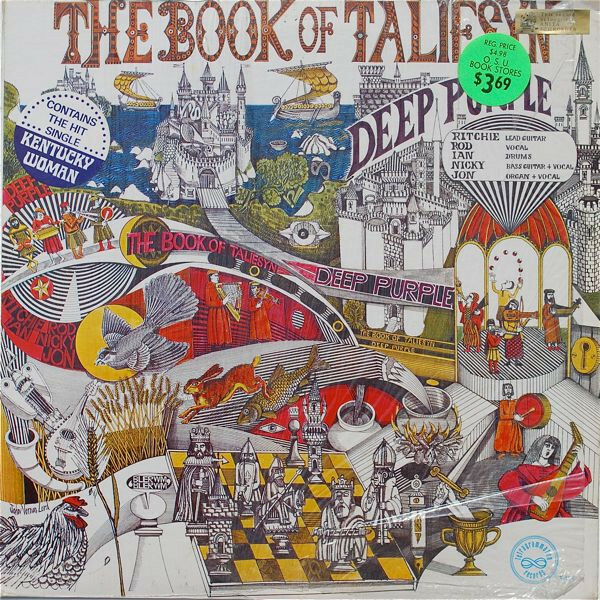 On its released in February 1974, it reached number three in Britain and number nine in the US Billboard 200. This resulted in gold discs in America, Argentina, Britain, France, Germany and Sweden. Then when Stormbringer was released in November 1974, it became apparent that Deep Purple had incorporated elements of soul and funk in their music. Despite this, Stormbringer reached number six in Britain and number twenty in the US Billboard 200. Stormbringer was certified gold in America,, Britain, France and Sweden. 1974 had been one of the most successful years of Deep Purple’s career. Sadly, 1975 was the beginning of the end. When Deep Purple’s tenth album Come Taste The Band was released in October 1975, guitarist Ritchie Blackmore had left the band. Replacing him on the album was Tommy Bolin. With this latest change to the lineup, Come Taste the Band still reached number nineteen in Britain and forty-three in the US Billboard 200. Come Taste The Band was certified silver in Britain, and gold in Argentina and Czech Republic. While Come Taste The Band didn’t match the success of previous albums, that was the least of Deep Purple’s worries. Following the release of Come Taste The Band, David Coverdale and Glen Hughes left to form Whitesnake. This lead to Deep Purple splitting up in 1976. However, Deep Purple reformed in 1984. This lasted until 1994, before Steve Morse revived the Deep Purple name. However, Deep Purple never again enjoyed the commercial success they enjoyed between 1970 and 1975. 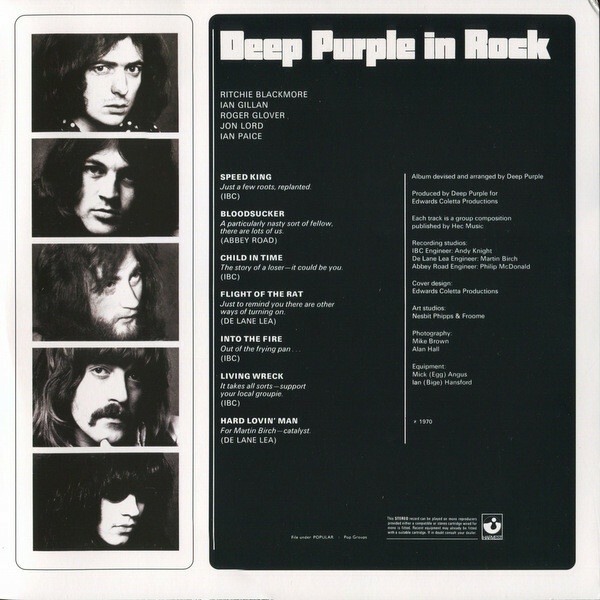 Deep Purple’s breakthrough album was Deep Purple In Rock in 1970. This was the start of five years of commercial success and critical acclaim. During that period, Deep Purple challenged Led Zeppelin and Black Sabbath for supremacy as most successful and hard rocking band. There was also another competition going on. This was to see which of the “unholy trinity of British hard rock and heavy metal” was the hardest living band. It was a close fought and hard won contest. Over the years, Deep Purple’s penchant for the rock ’n’ roll lifestyle was legendary. It came with the territory. This was after all, rock ’n’ roll during the early seventies. Chaos and carnage was omnipresent and expected as Deep Purple toured the world. This never seemed to affect Deep Purple’s music. Proof if any is needed, is Deep Purple In Rock. It features Deep Purple at their hard rocking, hard living best. 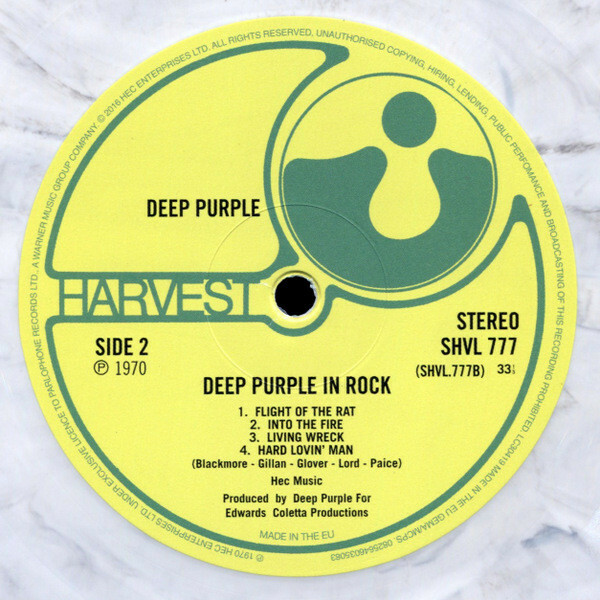 Tagged: Deep Purple, Deep Purple In Rock, Harvest, Ian Gillan, Ian Paice, Jon Lord, Richie Blackmore, Roger Glover, Shades Of Deep Purple, The Book of Taliesyn.